The ISFET sensing element is packaged onto a miniature PCB for easy handling. 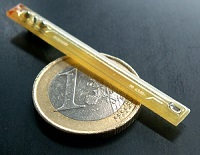 Microsens has developped a miniature reference electrode to work with the MSFET3330. More information can be found in the MSREF Datasheet. The MSFET3330 requires a specific interface electronics to drive the sensor and read the sensor output. Microsens offers a range of interfaces with different options. Details on the different interfaces can be found here. MICROSENS offers a measurement kit for the MSFET 3330 pH sensor. Contact us for more information on the ISFET Measurement Kit.